WHOEVER EATS MY FLESH AND DRINKS MY BLOOD REMAINS IN ME AND I HIM HIM. 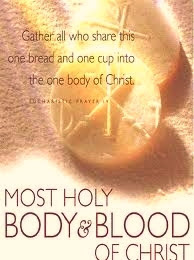 This Sunday is the Feast of the Body and Blood of Christ (Corpus Christi). It is a celebration of the reality of the real presence of Christ in the Eucharist and a commemoration of its institution. In our Gospel reading (John 6:15-58), we hear Jesus in his own words tell the crowds what his body and blood can be for them. He wasn't talking metaphorically and he didn't use ambiguous words. Jesus said to the Jewish crowds: "I am the living bread that came down from heaven; whoever eats this bread will live forever; and the bread that I will give is my flesh for the life of the world." The Jews quarreled among themselves, saying, "How can this man give us his flesh to eat?" Jesus said to them, "Amen, amen, I say to you, unless you eat the flesh of the Son of Man and drink his blood, you do not have life within you. Whoever eats my flesh and drinks my blood has eternal life, and I will raise him on the last day. For my flesh is true food, and my blood is true drink. Whoever eats my flesh and drinks my blood remains in me and I in him. Just as the living Father sent me and I have life because of the Father, so also the one who feeds on me will have life because of me. This is the bread that came down from heaven. Unlike your ancestors who ate and still died, whoever eats this bread will live forever." In our first reading (Deuteronomy 8:2-3, 14-16), we hear Moses reminding the people how God gave them bread to eat and water to drink in the desert. It is a contrast between physical nourishment of old and the spiritual nourishment of the new covenant. Moses said to the people: "Remember how for forty years now the LORD, your God, has directed all your journeying in the desert, so as to test you by affliction and find out whether or not it was your intention to keep his commandments. He therefore let you be afflicted with hunger, and then fed you with manna, a food unknown to you and your fathers, in order to show you that not by bread alone does one live, but by every word that comes forth from the mouth of the LORD. "Do not forget the LORD, your God, who brought you out of the land of Egypt, that place of slavery; who guided you through the vast and terrible desert with its saraph serpents and scorpions, its parched and waterless ground; who brought forth water for you from the flinty rock and fed you in the desert with manna, a food unknown to your fathers." In our Epistle Reading (1 Corinthians 10:16-17), St. Paul succinctly explains how we are all united in the breaking of the bread and the participation in the Eucharist. This Sunday, we are reminded that in the Eucharist, Jesus gives us, and we receive, his total and complete self. It is a gift that unites us, sustains us and redeems us. Believe it!